Pool Checkers is a Checkers variant that is popular in the southeastern United States. 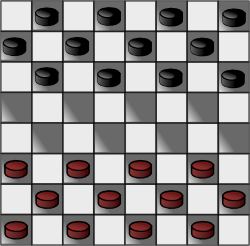 Like Standard Checkers, it is played on an 8x8 checker board arranged with a dark corner on the player's left. Each player starts with 12 pieces, which are played on the dark squares, and the player with the darker-colored pieces makes the first move. As in standard Checkers, the object is to eliminate all of your opponent's pieces from the board (or block them from moving). Single men may capture opponents both forwards and back. Captures are compulsory, but it more than one capture sequence is possible, the player may choose which to play, regardless of which would capture the most pieces. Pieces are not removed until a capture sequence is complete, and a sequence may not jump over the same opponent's piece more than one, not may a player jump over his own pieces. Kings are "flying kings" that can move as far as they want along unblocked diagonals. If, at the end of a game, one player has three kings and the other has one, the player with the three kings must win within thirteen moves, or the game is a draw.